Create cursors and animated pointers. Personalize the look and feel of Windows® by making and customizing your mouse pointers. 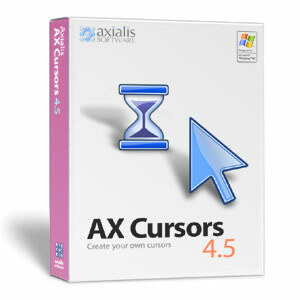 Axialis AX Cursors is a powerful and easy to use tool designed to Create, Extract Manage and Redistribute your static and animated cursors. 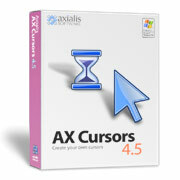 With Axialis AX-Cursors create, manage and distribute static and animated cursors! Now you can create fabulous cursor libraries, compile them and distribute them as self-executable files! You can also change the Windows® standard pointers by the cursors you've made. Create static cursors: Axialis AX-Cursors allows you to create all kind of static cursors (extension CUR - sizes from 16x16 to 72x72, custom sizes, black & white to 16,8 Million colors). When done, you'll be able to customize the Windows default mouse pointers with your own cursors (Arrow, Wait, Move, Resize...). If you're a developper, what a nice touch to add your own cursors in your applications! Create animated cursors: Use the advanced editor to create animated cursors (extension ANI). Many features permits to make smooth animated pointers. You can edit each frame in a powerful editor (see features of the static editor above). You can also specify the display delay of each frame and see a live preview of your pointer. Create animated cursors from FLI animations: Axialis AX-Cursors features a powerful feature that permits you to create an animated ANI cursor from an Autodesk® FLI/FLC file. Autodesk® FLI is the standard animation format used by 3D modeler applications like 3DS Max® or Cinema 4D®. Just create your 3D object, animate it and save it as FLI. Creating your ANI file will be a child's play with Axialis AX-Cursors. Integrated workspace: The application has a fully integrated workspace. All the tools are easily available on screen. The interface is multi-documents enabled. It means that you can display many cursors on several visible windows. Librarian with previews: Use a powerful librarian to easily manage all your cursor files. This is a dockable window (which can be hidden) where you can store, move, copy and extract all the files you're using in your work (static and animated cursors, libraries). Also, you'll be able to save your cursors directly in the librarian. Retrieving them will be done a click. 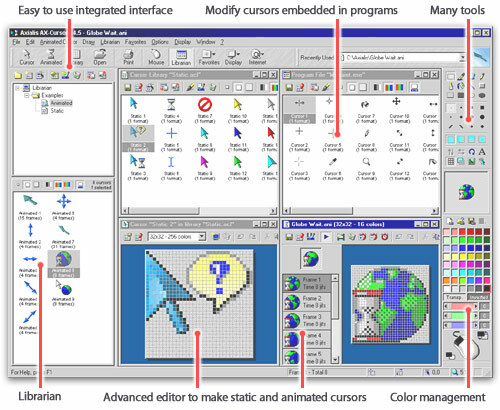 Modify cursors in programs: Program files (EXE, DLL, OCX) contain cursors. Of course, you'll be able to extract them to create independant CUR and ANI files. But that's not all: a powerful feature permits you to open program files and modify embedded cursors directly. With AX-Cursors add your own touch to third-party applications! Cursor, Mouse Pointer, Static Cursor, Animated Cursor, Create Cursor, Make Cursor, Cursor Maker, Cursor Editor, Windows Cursor, Manage Cursor, Distribute Cursor, Compile Cursor, ANI, CUR. Tryout Messages, Import/Export/Compilation limited to 5 cursors.